With his West Coast beach home sailing away into the Malibu sunset, actor Jeremy Piven turned his attention to marketing his Manhattan pied-a-terre. Perhaps the latter will sell a bit more quickly than the former, which took a couple of years and sold for $6.6 million. At $7.75 million, the duplex appears to be more aggressively priced than the Malibu home. 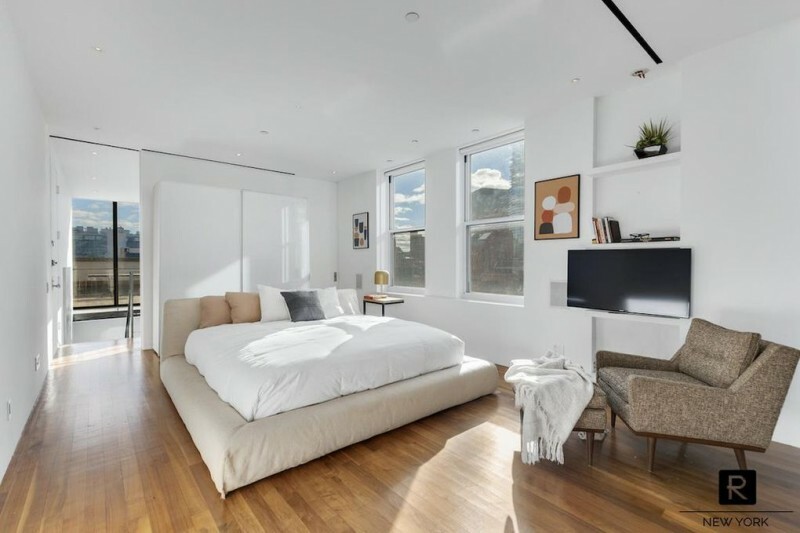 The unit is located in Tribeca’s 161 Hudson Street, a converted industrial building from the early 1900s that was developed as a loft condo high-rise in 2004. The unit features a living style distinguished by warmth and simplicity. There’s a lot of wood involved, with American walnut floors and a prominent staircase platform that transitions neatly into a raised fireplace hearth around the corner. With these design elements in place, the effect is well and truly a knockout: the naturally-finished wood gives way to a strictly utilitarian staircase design with an industrial-influenced balustrade, plenty of glass illuminates, and a double-height ceiling soars overhead. The style continues through to the kitchen, which balances a stainless-heavy restaurant-grade look and functionality with hardwood floors and accents. Upstairs, a master suite gets all of the available space, with an adequately-sized master bath and walk-in closet, and an outdoor garden terrace. A rooftop deck brings indoor and outdoor living areas to just over 3,000 square feet.